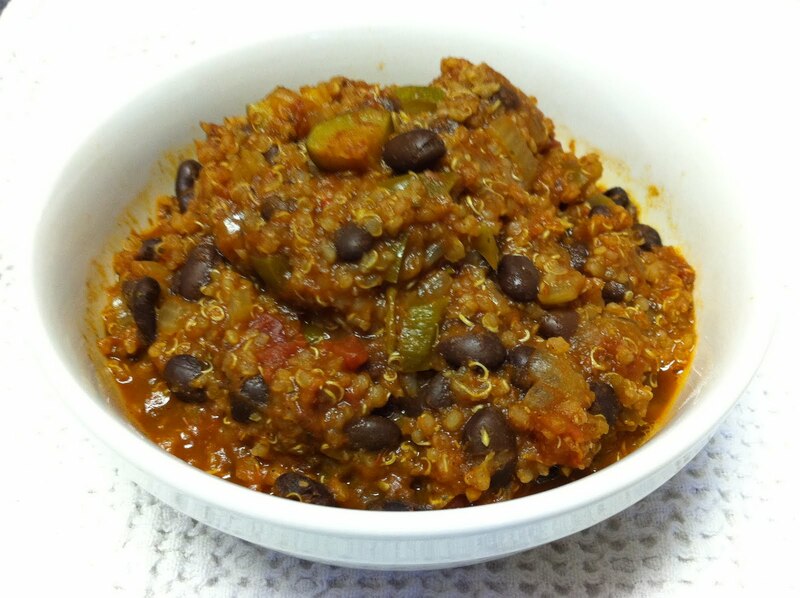 What happens when all the best stuff of life converge together in a bowl of chili? Bring the quinoa and water to a boil in a saucepan over high heat. Reduce heat to medium-low, cover, and simmer until the quinoa is tender, and the water has been absorbed, about 15 to 20 minutes. Set aside. Meanwhile, soften the onion in a tablespoon of water over medium heat. When the onion is transparent add the spices : garlic, chili powder, and cumin. Cook and stir 1 minute to release the flavors. Add 2 cups water. Stir in the diced vegetables : tomatoes, black beans, green bell pepper, red bell pepper, zucchini, jalapeno pepper, chipotle pepper, and oregano. Season to taste with salt and pepper. Simmer 20 minutes. Stir in the cooked quinoa. Remove from the heat, add the cilantro to serve. ← Today’s A Watermelon Slush Day!